Consultancy project, contracted by the South Australian Department for Manufacturing, Innovation, Trade, Resources and Energy (DMITRE). In November 2012, Angelique was contracted by DMITRE to design and facilitate a workshop exploring how schools and students could be involved with, and benefit from, the Tonsley Redevelopment Project in South Australia. Originally the automotive manufacturing site for Mitsubishi, Tonsley is now a key platform for the transformation of manufacturing in South Australia and will host multiple groups within society, from multinational companies and small businesses to university and training institutions. 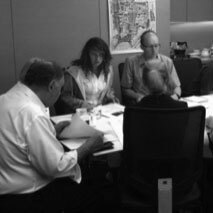 The Tonsley Schools in Business workshop was an exercise in integrated planning. It invited stakeholders of all ages and aspirations to be active participants in the planning stage of significant new infrastructure in their area, and in exploring the opportunities it offered each of them. The Tonsley facility and the programs it could host have the potential to provide educational, mentoring and career opportunities in the region for generations to come. Bringing young people, their teachers and schools, and business owners together to collaboratively shape the future is a significant forecasting technique of engagement. It allows participants to see their place in the project, generating a sense of excitement and ownership, which comes with being a creator of the process, rather than just a passenger. The students were both surprised and delighted to be included, and were keen to take the things they had learnt back to their respective school groups and canvass their ideas to bring to the table for the next conversation. This type of engagement is only possible where there is innovative leadership within the responsible departments, as demonstrated in this instance by Trixie Smith & Phil Ransome (Schools in Business) and Megan Antcliff (Director of the Tonsley project, DMITRE). The Tonsley Schools in Business workshop involved staff and 10 students from six schools, representatives from Flinders University, University of South Australia, Schools in Business, the South Australian Department of Education and Child Development and Department for Manufacturing, Innovation, Trade, Resources and Energy, and 2 local businesses. what values would you want it to embody? what would it look like as an experience? what kind of physical setting would best support that relationship? what performance requirements we’ll need from the physical setting at Tonsley to support and embrace the partnership, eg. a shared space where students can drop in? what facilities within Tonsley could be used for Schools in Business programs? what programs those spaces might offer to engage students with business and industry on site? International and national case studies were presented to prompt discussion about the strengths and weaknesses they demonstrated, and to develop an inspiring list of what participants would like to see at Tonsley. The workshop served as an introduction to the potential opportunities Tonsley affords, and each stakeholder’s place within it. Most importantly, it began to build the relationship between Schools in Business, Tonsley businesses and local schools, and offered them the tools for collaboration into the future.